This is one time it pays to be square (or to have nice even borders). Recommendations are one of the best ways to get new business. We love when our clients tell people about their experience with us and the quality of our work. 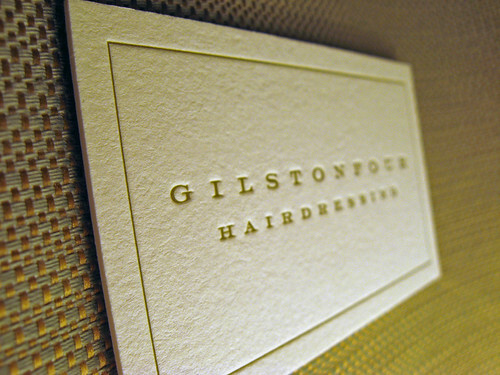 We printed a set of edge-colored business cards for Adam Cox, a strategist based in Australia, who then referred us to Timothy Millar, principal of Gilston Four, a hair salon also in Australia. 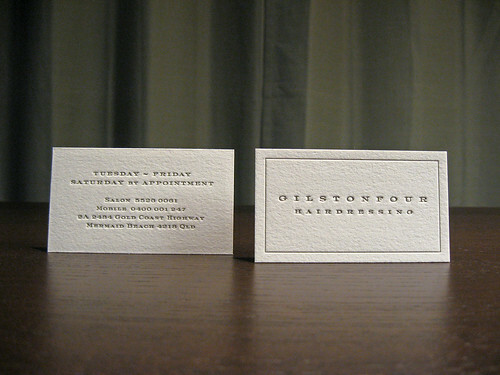 The cards were designed by Graham Milkins, a freelance creative from Australia. To match a color exactly, Tim sent us a swatch of wallpaper with the green color he wanted. Instead of using a direct pantone color we used the swatch on press to produce a relatively accurate match to the original green. 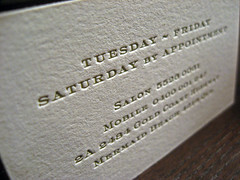 The business cards were letterpress printed on 220lb Lettra in pearl white, with 1-color on each side. One of Tim’s concerns was that the border be cropped evenly and square since a previous set of cards he had were off. The best way to achieve evenness is to maintain a tight registration so that the design doesn’t bounce on the printed sheet. 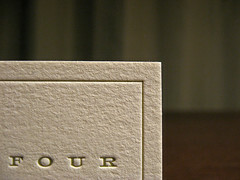 A little bit of extra attention when cutting the cards down ensures that all four sides are even and square (see above).